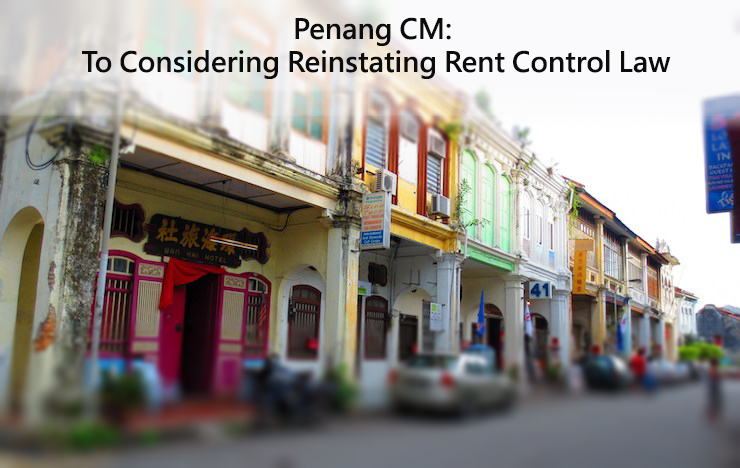 In response to the Penang’s Heritage Site being put at risk by foreign investors, Penang’s Chief Minister Lim Guan Eng is considering reinstating the rent control law. Previously reported in PropertyGuru, the elderly in Penang are being evicted and are being forced to be homeless due to callous property investors and increasing rental. Property experts are however attempting to discourage the reinstatement of rent control, as the last time this law was implemented, the prehistoric buildings were neglected as the landlords deemed the rental returns too low to be worth the effort. According to the landlords, the only people who benefitted from the low rental were the tenants who in turn rented out their homes to visitors. Chief Minister Lim Guan Eng however says that the act imposed this time will be different from the Rent Control Act 1966 as the building owners will still have a say in the rental rate of their properties. The only difference is that they will not be able to raise the rate exorbitantly as compared to its last rented rate. By doing so, the authorities hope to curb callous investors who are merely looking for rental returns, and ensure that the existing tenants who comprise mainly of the elderly will still be able to continue to afford living in their homes. Michael Loo, the executive director of PA International Property Consultants (Penang) Sdn Bhd believes that the majority of the tenants who are renting these heritage properties in Penang are local and foreign investors, including investors from Singapore. There are parties who do not approve of the rent control law, as they believe that it is a suppression of owner rights. According to Mark Saw the executive director of PPC International Penang Sdn Bhd, the move may have adverse effects on the interest of foreign investors in Penang, while Raine & Horne International Zaki + Partners senior partner Michael Geh says that she hopes that all owners and stakeholders will be consulted with before the move is implemented. Mark Saw further says that the last time that rent control was implemented, property values were stagnant, and only after lifting the laws did the value increase once the owners saw the value in their properties. He further urged the government of Penang to perform in-depth studies before carrying out their moves, otherwise there could be detrimental effects in the long run. Prior to the sudden interest foreign interest in Penang’s prehistoric buildings, the selling price of the buildings were only between RM500 and RM600 per square foot for the heritage properties. But the prices have now skyrocketed to between RM2,000 and RM2,500 per square foot – and after sprucing it up a little, the rental prices have also skyrocketed to as much as five times its previous cost.